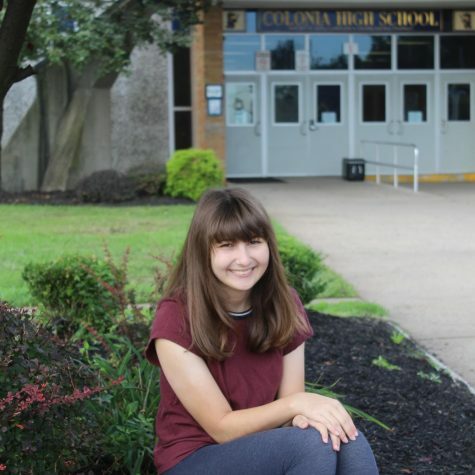 Robyn Epstein is a junior at Colonia High School. She has one older brother who is twenty and his name is Craig. They both enjoy going to the movies together and playing sports such as baseball and football. Epstein has one dog name Bosco who is an American bulldog mix. They enjoy going for walks together and playing in the backyard. In her free time, she likes to hang out with her friends, listen to music, watch T.V. and her favorite is to sleep. At Colonia High School, Epstein is on the bowling team and in color guard for marching band. Her favorite school subject is history because she loves learning about the presidents and what they did. When Epstein graduates High School her plans are to go to college, graduate and either become a special education teacher or a therapist. She also would like to travel the world and visit her dream location of Paris, France. Epstein super excited about this year and can’t wait to see what the future holds.